Are you ready for some serious fashion?! Tonight is the Met Gala (aka the fashion Oscars), and aattendees are sure to stun in rebellious creations that evoke the feeling of this year's Met Costume Institute exhibit Punk: Chaos to Couture. I can't wait to see what all the celebs and fashion icons wear. Have a look back at last year's amazing outfits here. In honor of the Met Gala, here are some punk inspired clothing and accessories that are sure to give any outfit some misfit edge. Punk inspirations have been seen on Spring 2013 and Fall 2013 runways of labels including Preen, Anna Sui, Christopher Kane, Phillip Lim, Jean Paul Gaultier , Versace and Moschino. 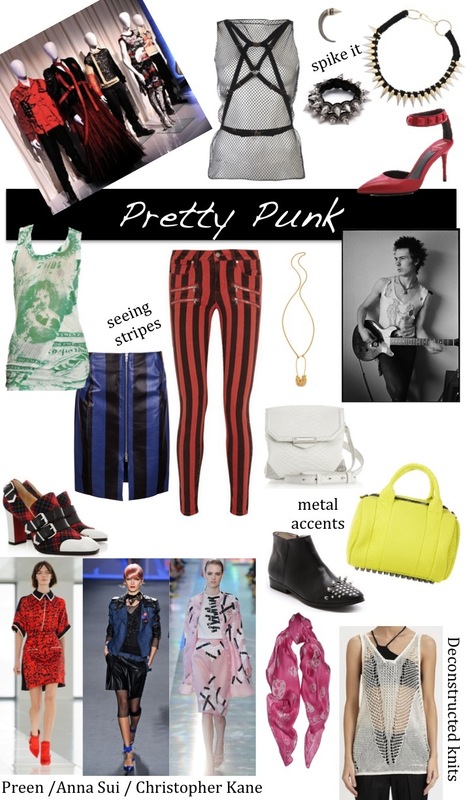 To achieve a bit of punk in your own style add in elements such as skull print accents, deconstructed open knits, plaid, homages to England, bold stripes and spike and stud jewelry and embellishments. "Punk: Chaos to Couture" will be at the Metropolitan Museum of Art Opens from May 9th - August 14th. Check out a sneak peak of the exhibit here. I'm SO excited to see what my faves wear! It's such a fun theme that they chose. I can't wait to see the live red carpet, it will be amazing! I already looked through the Met looks, and am obsessed with Nicole Richie!! Obsessed. Oooh did you get a chance to look at Nicole Richie! I wasn't a huge fan of her hair but a big fan os the risk she took! She is such an inspiration! love it! would you like to follow each other in gfc and bloglovin? let me know!